The United Republic of Tanzania is located in East Africa bordering so many countries including Kenya, Zambia, Mozambique, Uganda, Rwanda, Burundi, Malawi and the Democratic Republic of the Congo. The capital city is Dodoma, but Dar es Salaam is the largest city and financial hub as well as old capital. with 55 million population, it’s one of the most populous countries in Africa. Local currency is called “Tanzania Shellings” and $1 USD was equal to 2250 Shellings as of April, 2018. When I planned my African tour, Tanzania was not included in that. because I selected a single route by road which included Kenya, Uganda, Rwanda and then Zambia in the South. and the second reason was evisas and visas on arrival for the mentioned countries. I was not sure whether Tanzania offer visa on arrival or not (for Pakistani passport). However, when I went to Nairobi Kenya, I was told by many people that not to miss Mombasa in Kenya which is a city along the border with Tanzania. Therefore, I decided to visit Mombasa, and so the planned changed to Tanzania. the simple reason for changing my plan to Tanzania was the cost involved in traveling by air which is shockingly expensive in East Africa. I checked flights from Mombasa to Kampala (Uganda) which was more than $300 for a one way flight and then $300 more from Uganda to Zambia. that’s why I decided to go to Tanzania by road from Mombasa. 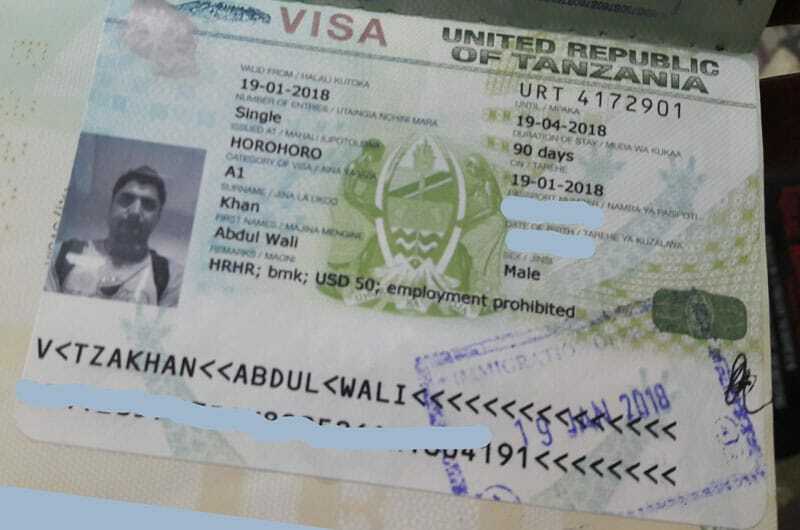 When I reached the border of Tanzania, I was still unsure whether I’ll obtain a visa on arrival or not, but I got a visa on arrival which was stamped in my passport, and I paid $50 USD for that. the border immigration was friendly but they did ask so many questions and delayed processing the visa. the payment is to be made only in $USD so make sure to have USD with you. Since travel by air was not an option due to expensive flights. I decided to go by road from Mombasa to Dar es Salaam. I went to a bus station in Mombasa a day earlier, and purchased a one ticket from Mombasa to Dar which was around $15. the Bus company name was “Tahmeed” and there are other companies as well at the same place. The bus had very comfortable seats and it was clean as well. the bus leaves three times in the morning to Dar i.e 6am, 6:30am and 7:00am. From Mombasa to Dar es Salaam in the bus. I was told that it’ll take 8 hours to reach Dar, but eventually it took 11 hours to reach Dar es Salaam. on the way, it makes a few stops at different cities in Tanzania and at least one hour stop at the Kenya-Tanzania border for the immigration procedure. I had a room booked online in Dar which was just $15 a day, but when I reached Dar city it was night time. and I found out that the place is out of the city where I had booked my room in a basic guest house. finding a low-cost accommodation was not easy in the center of Dar es Salaam. I went to many hotels but all were in the range of $50 to $60 per night, while I was looking for some $20 room per night. After some struggles, I found a shared room in the center of Dar Es Salaam city for $25. I stayed there for almost 3 nights. and luckily, I was the only one in that shared room, because nobody else had booked that during my stay. the hotel was a very good 2 or 3 star hotel called “Rainbow hotel”. so in general, you should expect a $50 room in the city center, while if you go outside the city center then you can easily find a room for $20 or less. I usually do booking online on Agoda.com which gives me cheap options almost everywhere in the world. Dar es Salaam has good transportation. Taxis are available in the city and cost around $5 to $10 for a ride. Uber is also available and will cost less than the normal taxis. There is a Metro Bus in Dar es Salaam which runs in the city and cover many areas. the ticket is just like .20 cents or 600 shellings per ride. The skyline can be seen from the the road. Food scene is good in Dar es Salaam. There are fast food restaurants such as Subway, KFC and many others which you can mostly find in the city center because I stayed at the city center. the price of fast food is normal within $5 for a single meal. Indian restaurants are many in Dar Es Salaam which I found on the “Jamhoriat Street” in Dar Es Sallam, that also cost around $7 to $8 for a good quality meal including soft drinks. Local food is vastly available on the streets of Dar Es Salaam which cost as little as $1 for a lunch or dinner. A guy who became my guide in Dar Es Salaam was always having that local food for $1, local food included some rice and daal on it. many other local food including sea food was also served on the streets and in small restaurants. One important thing to be noted here that Dar es Salaam is not a popular tourist attraction in Tanzania. it’s just a stop or arrival city. The Island of Zanzibar is the place where tourists go and spend their time. one can go to Zanzibar from Dar es Salaam using cruise or boat. The second popular activity in Tanzania is wildlife which can be seen in different parts, and the most popular place for that is Masai Mara which is located in both Tanzania and Kenya. However, I didn’t go to Zanzibar due to some undisclosed reasons. I stayed for two days and three nights in Dar Es Salaam only. I was staying at city center, so I went to many places by walking myself. Dar es Salaam is sometimes called the “New York of East Africa” because of the high rise building in the city center. If you want to see the skyline of Dar Es Salaam from the top then head on to “Tulip Hotel” in city center, and go to the 20th floor of that hotel where you can have a tea or coffee (because on the top there is a restaurant), and you’ll also see the whole city from there including sea. Dar es Salaam city view from Tulip Hotel. There are two main places in Dar es Salaam where you can stay and hang around. the one is city center which is the main place, the other place is called “Kariako” which is just next to city center. there are many shopping malls in Dar es Salaam, and local markets which are nice places to visit. The Dar es Salaam waterfront is also a few minutes walk from the city center, and you’ll find ferries going to Zanzibar from there. there are also very big cruise going to Kigamboni which is another area in Dar es Salaam, that’s very interesting cruise because thousands of people travel in that after every 10 minutes. the Kigamboni is a type of Island within the Dar es Salaam city. There is a Fish Market near the Ferry station, that’s very interesting market. you’ll find hundreds of species of fishes in that market and many of them live in water. be cautious that recording video or filming is not allowed in that market. However, visiting the market was a great experience. I also went to Kigamboni using the big cruise, it cost me only a few cents. on the other side, you’ll find beautiful small villages and beaches which has a nice and clean water. from there, you’ll clearly see the skyline of Dar es Salaam and city center Dar which is a wonderful scene. it looks like Toronto harbor from there. Overall, Dar es Salaam is a beautiful and clean city. and crime rate is also low compare to other cities in the region. let me know if you have any questions and have a safe journey to Tanzania 🙂 and don’t forget to watch my travel videos from Tanzania.